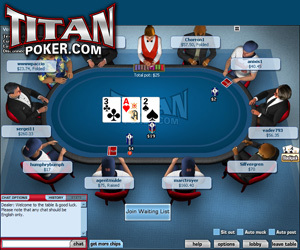 Titan Poker installs seamlessly and gives the ability to choose from multiple languages during the set up, on signing in you are presented with a pop up box offering up and coming big money tournaments. They have a really friendly customer support team VIA live chat and respond amazingly quickly; the team will always respond to you in first name terms. When creating your profile, you can choose from ten different avatars the avatar that you want to use when you are playing at a table. You can also add some customisable features such as auto muck, view hand strength and show folded cards to name a few; as standard for your play. 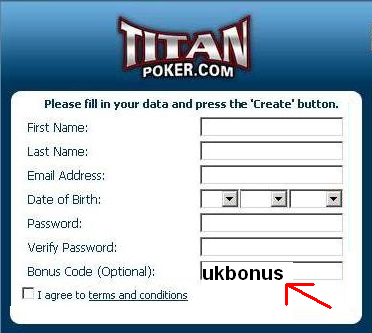 When Signing up for titan Poker enter the Bonus Code ukbonus and receive free bonus dollars to play poker with. During play the chat is friendly and you can trace the game history in the chat window, there is also a privet chat facility and the option to add friends to your buddy list. A nice feature of the chat is that when a player makes a comment the comment appears in a speech bubble above the player’s head, making it quicker and easier to see who is chatting to you. Another nice feature of the chat is that in the dealer chat you have little cards displaying your cards, as well as the flop, turn and river – this is very handy, to look back at a hand, especially if you have folded and want to see what hand you would have made. The game play is as smooth and easy to play as I have seen online, if you would like to sit out a few rounds you can always choose the auto flop option and re-join the game when you are ready. To visit the Titan website yourself and find out more about them click on this link.